Tangerines being in the citrus fruit group which has a loose and easily peeled skin that zips right open. The sections of tangerines separate easily and are very sweet. There are many varieties of tangerines in your supermarket. Clementine which is (also known as Algerian tangerine) are small, sweet-tasting and seedless tangerine. The membranes covering the carpel's are thinner than in other tangerines, and the texture of the tangerine fruit is very delicate. Most clementines are imported from North Africa and Spain. Season for clementines are November thru April. Tangelo is a cross between a tangerine and a grapefruit or pomelo (a large citrus fruit that is related to the grapefruit); the name is a combination of tangerine and pomelo. Tangelos look like large oranges; the most popular variety, Minneola, has a distinct knob like projection on the stem end. Although they are closer to tangerines than to grapefruits in flavor, they have a taste all their own. Season for tangelos are November thru February. Tangerine which is also known as the mandarin and the name tangerine is often used interchangeably, however a tangerine is actually a group of the mandarin orange. The flavor is distinctive and slightly tart. Tangerines are somewhat flat at the ends and have deep orange, loose-fitting, pebbly skin. Honey tangerines, which were originally called Murcotts, have deep orange flesh, but their skins are more green than orange. They are very sweet, as their name suggests. The season for tangerines are November thru January. Temple which is also called a Royal mandarin, this fruit is a tangor, which is a cross between a tangerine and an orange. Temples resemble overgrown tangerines and have many seeds. They are very sweet and juicy, and their flavor is similar to that of an orange. The season for temple is January thru March. When shopping for tangerines/mandarins with their loose-fitting skins, will feel soft and puffy compared to oranges and should also be heavy for their size; otherwise, they might be pithy and dry. Make sure to choose fruits with glossy, deep orange skins, but disregard small green patches near the stems. Storage tangerines in the refrigerator for up to 7 days. Tangerines, Algerian Tangerines and other mandarins are easy to prepare for use in fruit salad or cooked dishes, just peel the fruit, separate the segments, and then pull off the membrane from the segments, if desired. Also be sure to remove the pits, which may be many or just few depending on the variety of fruit. Adding tangerine segments to coleslaw or tuna salad is great for a delicious and colorful treat! Tangerines, Mandarins and Tangelos are all great for snacking because they are easy to peel and eat. Tangerines are very high in Vitamin C.
These citrus fruits are bright orange in color and each one has a distinctive sweet flavor all its own. Tangerines are grown in Arizona, Florida, California and Texas. 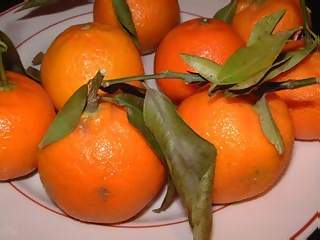 The Algerian tangerine originates in the nation of Algeria in North Africa. All tangerines are nutritious and delicious! For information on the great fruit cantaloupe go-here for cantaloupe web site. The tangerine is a type of Mandarin orange. Tangerines are sometimes called “Christmas oranges” because some children get them in their Christmas stockings. The name “Tangerine” comes from the city Tangier, Morocco where people first shipped the fruit by boat to Europe. Tangerines are easy to peel and very healthy, making them a great snack! Tangerines, also know as mandarins, are a type of citrus fruit. They are easier to peel compared to other citrus fruits and are sometimes called “easy peelers”. Tangerines are bright orange in color and have a distinctive sweet flavor. 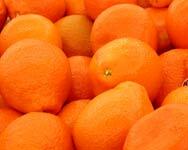 China produces more tangerines than any other country. Most of the tangerines produced in the United States come from Florida and California. Tangerines grow on trees. Tangerine trees grow best in subtropical environments where the nights are cool. A mature tree is usually between 15 and 20 feet tall. Tangerines are packed full of vitamin C and fiber. One tangerine has half the vitamin C you need for the whole day!